Researchers from the US National Institute of Standards and Technology (NIST) developed a new graphene substrate that may enable wafer-scale graphene production. 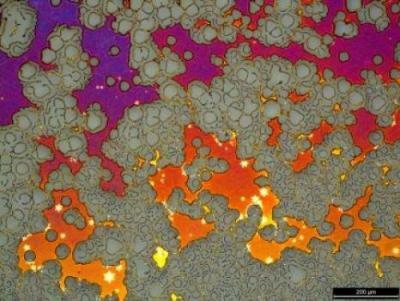 The new substrate is actually copper, but with huge crystalline grains. Graphene is usually grown on copper, but regular copper films are usually destroyed in the high temperatures required for graphene growth - as can be seen in the image above. The new substrate developed at NIST, with its massive crystalline grains survives the high temperatures. The researchers use a two-step process to make the new substrate. Firstly copper is deposited on a sapphire wafer at room temperatures. Then the copper is annealed - near the melting point of copper.